3. On November 10th, 1483 a miner and his wife gave birth to a son. Baptisms were done quickly due to infant mortality. The n ext day Hans and Margarette brought their son for Baptism, St. Martin’s Day. So they named him Martin, as was the custom, after the saint’s day he was baptized. The son baptized today was Martin Luther. What do these 3 commemorations have in common? These two Christian saints and veterans is all about being a soldier. We give thanks for those veterans who served in our armed forces. I have heard many a veteran say that I did my duty and I came home. War is hard, to say the least. Many veterans do not want to say what happened over there. They bore arms to defend our freedoms inscribed in the Constitution, the words of the charter of our political freedom. 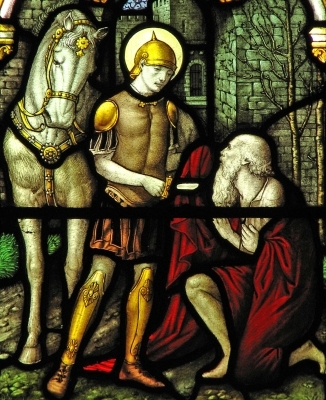 Martin of Tours left one army and joining the militia Christ, the army of Christ for the salvation of souls. As bishop he did battle against the heresies of his day and served his people the green and eternal pasture of the Word of God. He fought against the powers and principalities: sin, death and the power of the devil. The man named after him, Luther, likewise did the same. Martin and Martin bore the weapons of the Spirit to defend the charter of our eternal salvation, one Lord, one faith, one birth. Martin and Martin did their duty, lived their callings. This day is united in thanksgiving for our freedom, political and spiritual. We are freed from tyranny of political and spiritual despots and so freed to serve our neighbor, our nation and church, as free citizens of both that any tyranny is defeated.